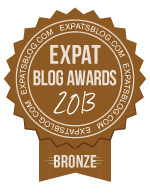 ExpatsBlog.com Expat Blog Awards 2013: France Bronze Award! This blog won the Bronze Award for best expat blog in France! One of my favorite blog ever !!! Thank you for making me laugh so hard ! I love your blog. This blog is hilarious and very informative. I recommend. British humour at its best! One of the few blogs I make the effort to read on a regular basis! Un blog frais, diversifiÃ©, aussi pÃ©tillant que peut l'Ãªtre son auteure ! My only and FAVORITE blog !!! Humor with a kind of "french mauvaise foi" ! Thank you Miss L.
MM gets my vote! MM lives in France with Husband PF, Bigfoot, Rugby-boy and Little My (oh... and a Smelly Dog)- and blogs about their daily life there, with lots of funny and entertaining bits thrown in for good measure, and lots of British humour. Check out their blog! How many wonderful things can I say about MM - they would never end! She is fantastic & her blog so entertaining! She deserves the reward with highest honors. You only allow 5 Stars - I'd give her 10! Yo, of course it has what it takes to win! Hopla geiss, let's all vote for this amazing blog! Brilliant blog, very funny. I read it on a Monday morning when I need cheering up. Gently comic, wryly observant, sometimes searching, often stimulating, never dull - this woman simply loves life! Great work, thank you for doing it. keep going! Refreshing to read, taking the rough with the smooth and the light with the dark. Thank you! I love this blog! It has a little bit of everything and very funny and witty ! This blog reminds me of P.G.Wodehouse's numerous writings, so typically British humor. She largely deserves a five stars. Fun and lively blog. Keeps you waiting for the next post. Also this blogger promotes other bloggers and interacts with their followers. 5***** rating from here! I always take the time to read her journal because it's reality in a funny way. Love it! A new reader to this blog, I've already signed up to get updates as it's witty, intelligent and well written. Just the sort of blog I like!